OnTarget ARA Scoring - Automatically score targets and export the results. 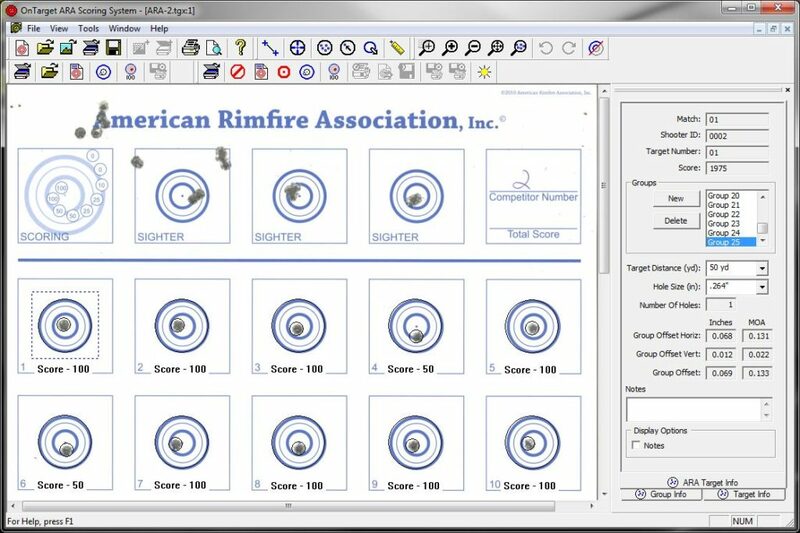 The OnTarget ARA Target Scoring System is used to automatically calculate the scores of American Rimfire Association benchrest targets. 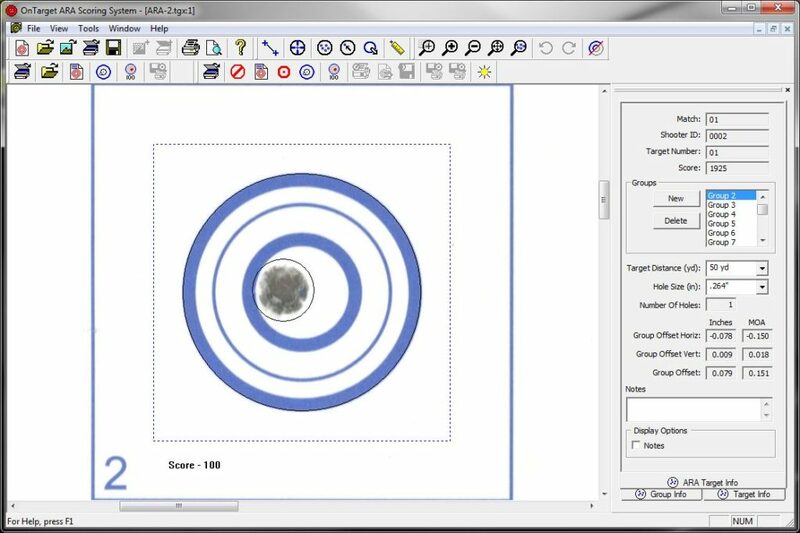 The target is scanned and imported into a new project, the program prompts for the shooter information, then automatically scores the target and flags any shots that need to be checked manually. After the scores are verified by the user, the target project is saved and the score data is exported to a Microsoft Excel spreadsheet or compatible file. The OnTarget ARA Scoring program dramatically decreases the time needed to score a target and tabulate the results. If you are an ARA match director please contact us for access to download the program. If you are looking for a scanner that can handle the 11"x 17" ARA targets, many match directors are using one of the Brother all-in-one printers with the 11"x17" scanner. The Brother units are very affordable and preform well on the ARA targets. 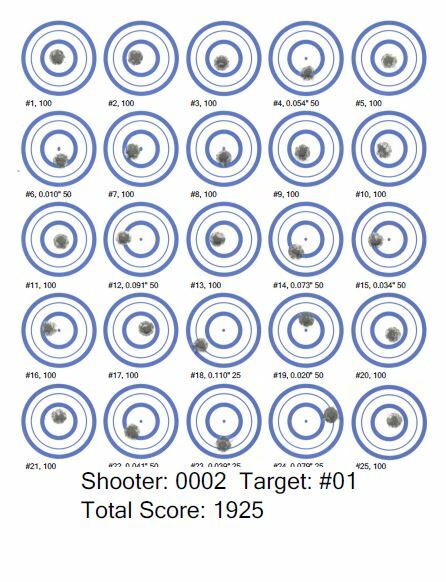 In addition, depending on the number of shooters and targets at your typical match, you may want to purchase a separate laser printer to cut the cost of printing the score sheets. Check online and at your local office supply stores for the best price on the unit. Adjusted margin for displaying "***" on automatically scored bulls. Enabled the distance text and 'P' on the score sheet. These had been disabled in a previous version. Changed "Barcode" button to "Set Target Info". Disabled the target info fields at the top of the ARA target view to prevent accidentally changing values. Hit the "Set Target Info" button to change values. Changed the displayed text from "Locked" to "Set" when a score is adjusted. Removed distance text and 'P' from the score sheet. Added a checkbox to the options dialog to enable the scanner selection dialog. Changed program so it will not attempt to open Excel if the data export file name field in the options dialog is blank. Added option to allow images scanned on the PlusTek scanner to be scored more accurately. Target data can be rotated from the inside the Target Data dialog to match the direction the target was mounted on the stand. The datasheet printed data will be rotated to the current orientation. Added a "Print Data..." button in the Target Data dialog. Data sheet can be printed without leaving the dialog. Removed the Group Data By Row and Additional Group Data from the target datasheet printout when the orientation is not set to Top. New Help system. Has instructions for setup and operation of the ARA Scoring System. Fixed a problem with the score not recalculating when bullet holes were added and removed manually. Fixed problem with the group list box not updating correctly when groups were deleted from the target. Added disclaimers to the target datasheet print out and the composite group dialog stating that the scores shown are not the official match scores. Removed the command to save the .xls after exporting a score. Saving document for each export was causing a significant delay. File will be saved if .xls is set to be closed automatically. Removed code that was showing Excel when it was opened. Now the OnTarget program will stay at the front when exporting scores. Fixed up the paths and file name fields in the ARA Options dialog so the values are correctly saved, recalled, and used when saving and opening files. Rearranged the controls in the ARA options dialog so all controls will be visible at all screen resolutions. Changed the score export code to write directly to the ARA Scoring program created by Doug Weeter. The intermediate .xls file is no longer needed. The target score sheet printout is now centered and the font sizes are correctly scaled. There are new font size defaults in the ARA options dialog. Added separate fields for the .csv and .xls data file names. The program now exports the data to both files. Fixed crosshair color in the virtual group dialog. Improved the ARA options dialog, added several group boxes and improved field and checkbox descriptions. Added call to initialize COM operation before exporting score data. Check file extension to determine type of data file to save, .csv or .xls. Added setting in the Options dialog for the text and bull sizes on the target score sheet printout. Added registry entry Settings/AutoCloseExcel=0. Set to '1' to close Excel when done exporting data. Added fields in Options dialog to set the text and bull sizes on the target score sheet printout. Added new hotkey 'W' for zoom-to-width. Added the target data dialog and printout to ARA program. Corrected a problem detecting multiple bullet holes in a target. Added optional "drag" scrolling functionality. Enable/disable in Options dialog. Changed composite group dialog to use correct bull definition for drawing. Added code to export directly to Excel Scoring Programs. The necessary .xls files have been added to the installation package. Added code to check and warn the user before exporting duplicate scores. Added check to the target data export function that will notify the user that the file is locked by another program and allow them to close that program and retry opening the data file. Default the target number value in the target information dialog to the last used number. Set the focus in the target information dialog to the Shooter ID field instead of the Match Number. Fixed first miss calculation after manually setting the score. Better ruler and set reference operation.